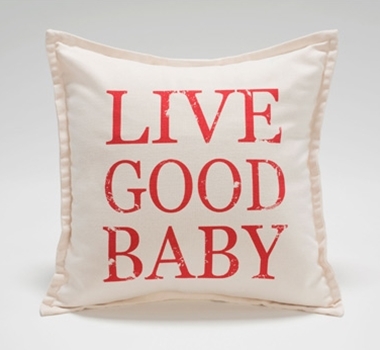 In bright red letters on organic cotton canvas, this pillow announces that your little one is living the good life that pairs comfort with sustainability. Water-based ink is used to screen the letters onto unbleached organic cotton canvas, and the back closure features soft fabric ties. Each pillow comes with an organic insert stuffed with organic fibers from the kapok tree. These inserts are moisture-resistant, quick-drying, lightweight, completely hypo-allergenic, mold resistant and odorless.